This site was excavated in 1932, 1948, 1952 and 1953. Two circular Iron Age houses and an Iron Age rectangular structure were recorded. The settlement was probably in use between 500 and 400 BC. 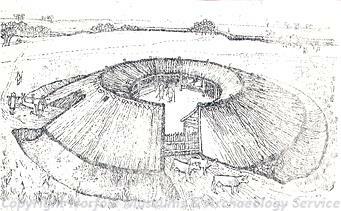 The circular houses were built around an oak post frame and lay within a bank and ditch earthwork. At least four Palaeolithic worked flint objects were also found within the gravels underlying the site, including two Levalloisian artefacts. A shaft for an 18th century ice house was also discovered. There is also a more complete 18th century ice house on the hill.The two ring ditches are visible as earthworks on the available aerial photographs of the site, as is the rectangular structure recorded during excavation. On top of Micklemoor Hill (glacial knoll) two circular houses and rectangular structure. By J.G.D. Clarke for Prehistoric Society and NRC. Modern. Possibly shaft for ice house. Also another 18th century ice house recorded on the hill. Hearths. Posts probably oak. Houses probably pennannular. Site II was timber framed house, post ring with porch surrounded by bank of turf and ditch containing much Iron Age pottery, clay spindle whorls, antler hafts for iron tools. Flint industry of flakes, cores, scraper and hammerstones. Three saddle quern fragments. Domestic animals - ox, sheep, large dog. Wild animals - pig, red deer, crane, beaver. Impression of wheat (probably spelt). Roundhouse. 10.98m (36 feet) diameter. Settlement originated around 420 to 400 BC but later work elsewhere puts it back to 500 BC. In the course of the excavations several Palaeolithic worked flints were also found, incorporated within the sandy pleistocene gravel that forms the hill. These artefacts were described in (S1) and included a side scraper and a Levallois flake. Drawings of both the side scraper and the Levallois flake were included in (S1), the originals of which are now held by HES (S13) (S14). Another object was described as a core. Four Palaeolithic worked flints from this excavation are known to be amongst the material now held by the Norwich Castle Museum (NWHCM : 1932.165/NWHCM : 1953.39). These finds are listed in (S3) as 1 retouched flake implement (the side scraper), 1 unretouched flake and 2 Levallois flakes. These objects were subsequently described by Wymer (S4) as 1 side scraper, 1 Levallois flake-blade and 2 rolled primary flakes. The scraper and the flake-blade are illustrated in (S4) - see copy of original drawing held by HES (S15). These finds are also noted in (S16) and (S17). Amended by P. Watkins (HES), 28 March 2013. Earthworks of houses are visible in clearing in wood accentuated by long grass, but are partly also under trees. Ice house (NHER 6019 context 1) is in mound, very large chamber, no entrance tunnel (but this has probably been destroyed). Brickwork suggests early 18th century. State identical to 1978, except for hole around 1m diameter between Site I and II. Department of Environment state that this was never 'properly' scheduled despite issuing of form and plan. But is under consideration 1984. Ice house is listed building. Note. Site no longer Forestry Commission owned. (S7) suggests the site is best interpreted as a small defended farmstead dating to the 8th-7th centuries BC and has become a nationally significant ‘type-site’ for the study of Early Iron Age pottery. (S8) suggests a possible Late Bronze Age – Early Iron Age, due to similarities with other ringworks of this date encountered in Kent and Thames Valley. S. Massey, 31 January 2008. The two ring ditches and rectangular structure described above are visible as earthworks on the available aerial photographs of the site of Micklemoor Hill (S9-S11). A complete sub-circular ring ditch is visible, centred on TL 9741 8573. It measures approximately 29m by 23m internally and 35m x 28m externally, the ditch itself up to 3.8m in width. A second ring ditch is visible centred on TL 9734 8572. It measures approximately 31m by 32m internally, 39m by 40m externally, and the ditch measures up to 3.9m in width. A possible rectangular structure is also visible centred on TL 9732 8567. It measures 13m by a minimum of 26m and appears to have an entrance or break on its southern side, at TL 9732 8567, although it is hard to be certain of this since the earthworks are rather ephemeral and the site appears to have suffered some erosion or possible quarrying (See S9). The site is tree-covered on the most recent Google Earth imagery, so it is not clear whether the earthworks survive. E. Bales (NMP), 28 August 2012. The only part of the site which is designated is the icehouse (Listed), according to the National Heritage List. D. Gurney (HES), 2 November 2012. 2012. The site, often conventionally placed in the earliest Iron Age, has examples of "late" Decorated pottery vessels, one of which has been C14 dated to 510-380 Cal BC. According to (S12) this demonstrates how vaguely we understand the settlement or its ceramics. D. Gurney (HES), 8 November 2012. --- Aerial Photograph: TL9685 (pre afforestation). --- Unpublished Document: Clarke, J.G.D.. West Harling Micklemoor Hill. Iron Age Farmstead Excavations. 1948. 1952. 1953. Field Notes..
--- Unpublished Document: Clarke, J.G.D.. West Harling Micklemoor Hill. Excavation of Iron Age A Site. 1948. 1952. 1953. Field Notes..
--- Unpublished Document: Clarke, J.G.D.. West Harling Excavations. 1948. 1952. 1953. Field Notes..
--- Unpublished Document: Turner, J.E.. On suggested reconstruction of West Harling House. --- Unpublished Document: Various. Letters. Various correspondence concerning Micklemoor Hill excavations..
--- Photograph: Various. Micklemoor Hill excavations and finds..
--- Illustration: Plan of Iron Age round house. West Harling, Norfolk..
--- Illustration: Pottery from Site II, Micklemoor Hill, West Harling..
--- Illustration: Pottery, worked bone and spindle whorls from Site II, Micklemoor Hill, West Harling..
--- Illustration: Reconstruction of Iron Age round house. West Harling, Norfolk..
--- Newspaper Article: 1977. Eastern Daily Press. 3 January. --- Newspaper Article: 1948. Eastern Daily Press. 15 November. --- Archive: Clarke, R. R. and NCM Staff. 1933-1973. Norwich Castle Museum Record Card - Iron Age. Harling (west) . --- Article in Serial: Clarke, R. R. 1954. Norfolk Research Committee Excavations 1953. Norfolk Research Committee Bulletin. Series 1 No 6 (for 1953) p 1. --- Photograph: CXV 22 to 26. Micklemoor Hill. <S1> Article in Serial: Apling, H.. 1932. A Hallstatt Settlement at West Harling, Norfolk. Proceedings of the Prehistoric Society of East Anglia. Vol VII, Part I, pp 111-122. <S2> Article in Serial: Clark, J. G. D. and Fell. C. I. 1953. The Early Iron Age site at Micklemore Hill, West Harling, Norfolk, and its Pottery. Proceedings of the Prehistoric Society. Vol XIX Pt 1 pp 1-40. <S3> Monograph: Roe, D. A. 1968. A Gazetteer of British Lower and Middle Palaeolithic Sites. CBA Research Report. No 8. p 242. <S4> Publication: Wymer, J. J. 1985. Palaeolithic Sites of East Anglia. p 143. <S5> Unpublished Document: Wymer, J.J.. 1984. Note on a visit to the site on 17th January 1984.. 17 January. <S7> Article in Monograph: Ashwin, T.. 1999. Studying Iron Age settlement in Norfolk. Land of the Iceni. <S8> Monograph: Yates, D. T.. 2007. Land, Power and Prestige: Bronze Age Field Systems in Southern England.. pp 100, 117. <S9> Vertical Aerial Photograph: RAF. 1946. RAF CPE/UK/1801 3153-4 25-OCT-1946 (NMR). <S10> Vertical Aerial Photograph: RAF. 1951. RAF 58/651 4276-7 24-APR-1951 (NMR). <S11> Vertical Aerial Photograph: CUCAP. TL9685A, TL9785AZ, ABA-ABD (CUCAP AZ/30-32). <S12> Article in Monograph: Brudenell, M.. 2011. Late Bronze Age and Early Iron Age pottery in Norfolk - a review. The Iron Age in Northern East Anglia: New Work in the Land of the Iceni.. pp 11-24. <S13> Illustration: [unknown]. 1953. Drawing of a Middle Palaeolithic flint Levallois flake West Harling. Card. 1:1. <S14> Illustration: [unknown]. 1953. Drawing of a Palaeolithic flint side scraper from West Harling. Card. 1:1. <S15> Illustration: Wymer, J. J. Drawings of a Palaeolithic flint side scraper and Levallois flake-blade from West Harling. Card. 1:1. <S16> Unpublished Document: Wessex Archaeology. 1996. The English Rivers Palaeolithic Project. Regions 9 (Great Ouse) and 12 (Yorkshire and the Lincolnshire Wolds). p 99. <S17> Website: TERPS online database. Site 22722.